Louisiana Purchase - San Diego Dining Dish! 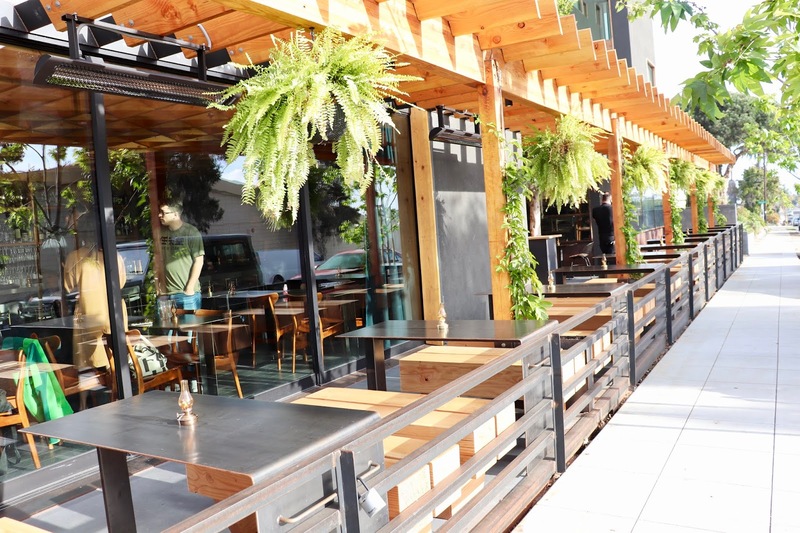 Although it may seem that North Park has everything, a glaring need for this neighborhood with so many eclectic eateries is a fine Cajun restaurant. Opening just last month, Louisiana Purchase has stepped in to fill this need with Cajun cuisine featuring a California ingredients. 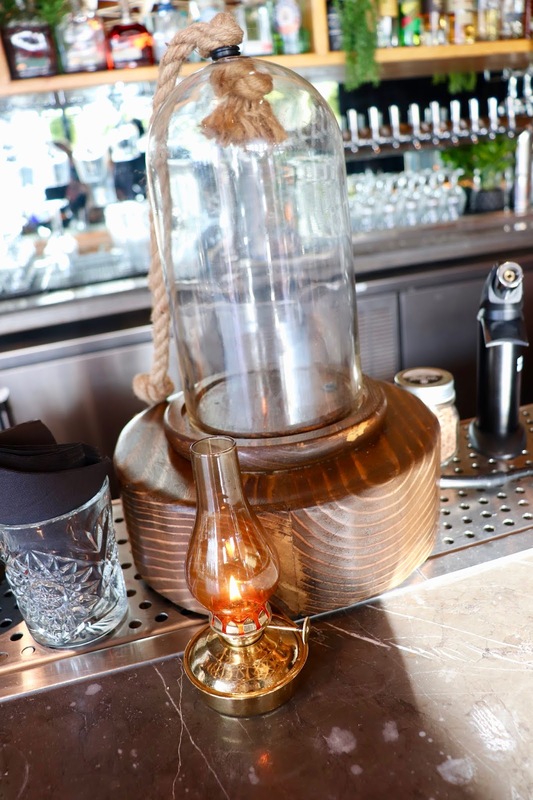 Executive chef Quinnton Austin recently relocated to San Diego from New Orleans, bringing his recipes and ingenuity for cooking new and exciting dishes, but honoring the culinary traditions of the South. 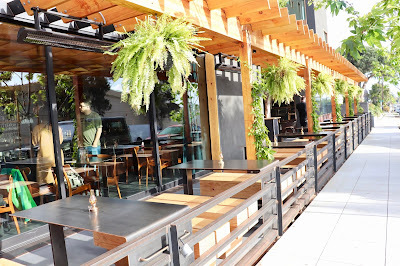 The concept follows the "shared plates" approach, with New Orleans favorites like crawfish etouffee and the unique alligator Andouille cheesecake (a savory cheesecake spread featuring gator meat and andouille sausage). Speciality cocktails are a must, and Louisiana Purchase serves up a number of French Quarter-inspired doozys. 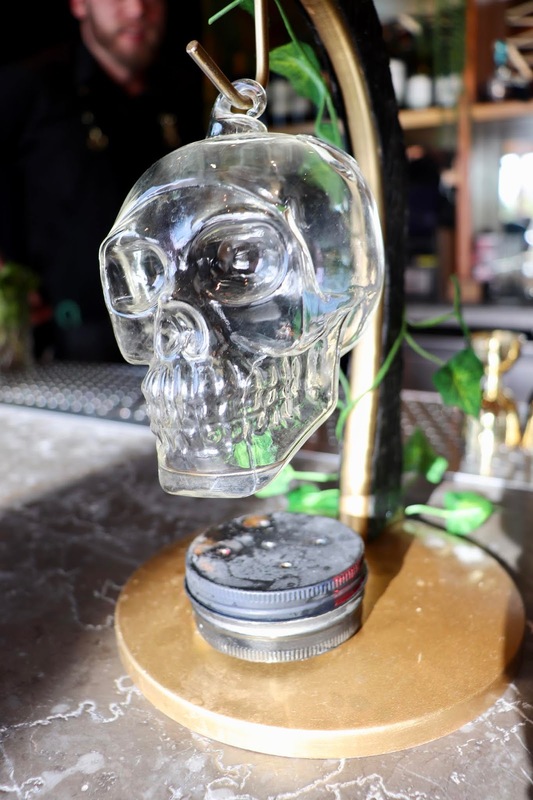 Featuring a full bar with delights like the Hurricane, among other, more fantastical drinks served with the show of dry ice and theatrics to delight patrons before they even sip their drinks. 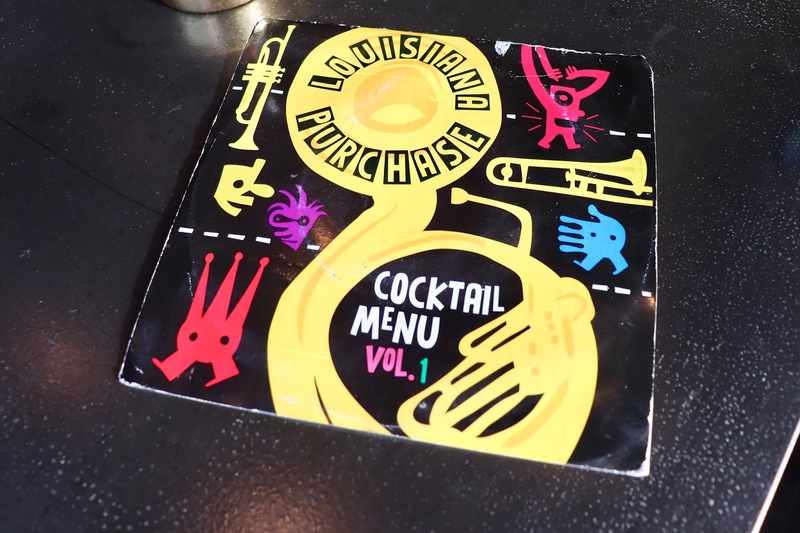 The cocktail menu is served at 45 rpm, lending even more to the fun atmosphere among elegance -- a trademark of New Orleans. 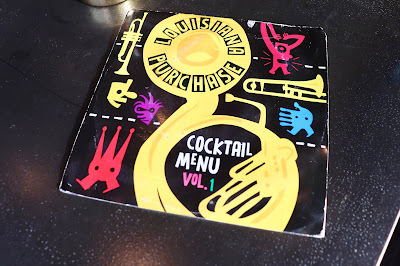 To start off our meal, we ordered the Hurricane Pop and Praline Old-Fashioned. 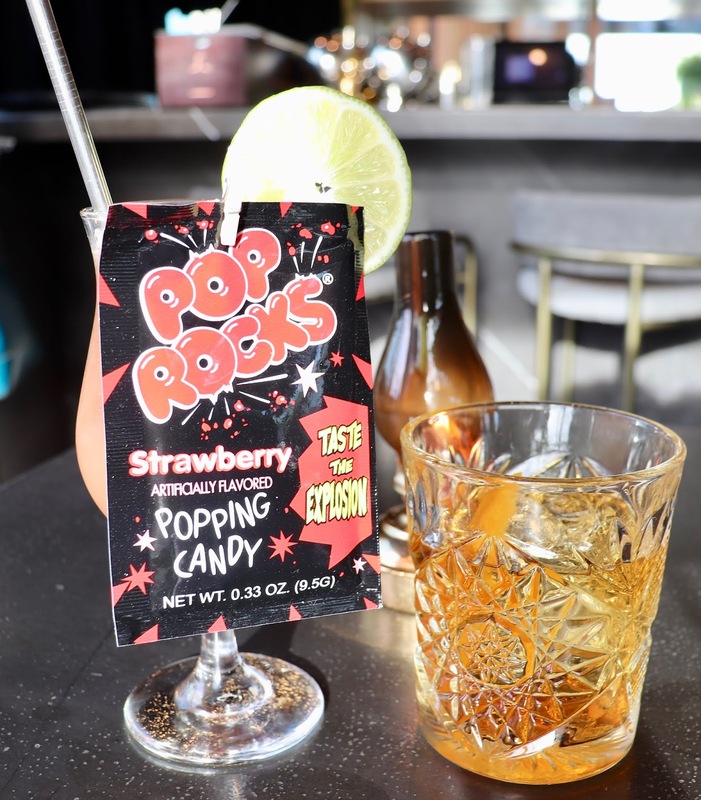 The Hurricane comes with a bag of Pop Rocks candy to pour into the drink! So fun, and the Hurricane was solid even without the added kitsch of the candy. The Praline Old-Fashioned was probably the best old-fashioned that I've ever had. Praline candies are a huge thing in New Orleans, and this drink incorporated the caramel flavoring into a delicious drink to create something familiar, yet new and innovative. It wasn't long before we had good old crawfish etouffee on the table to share. 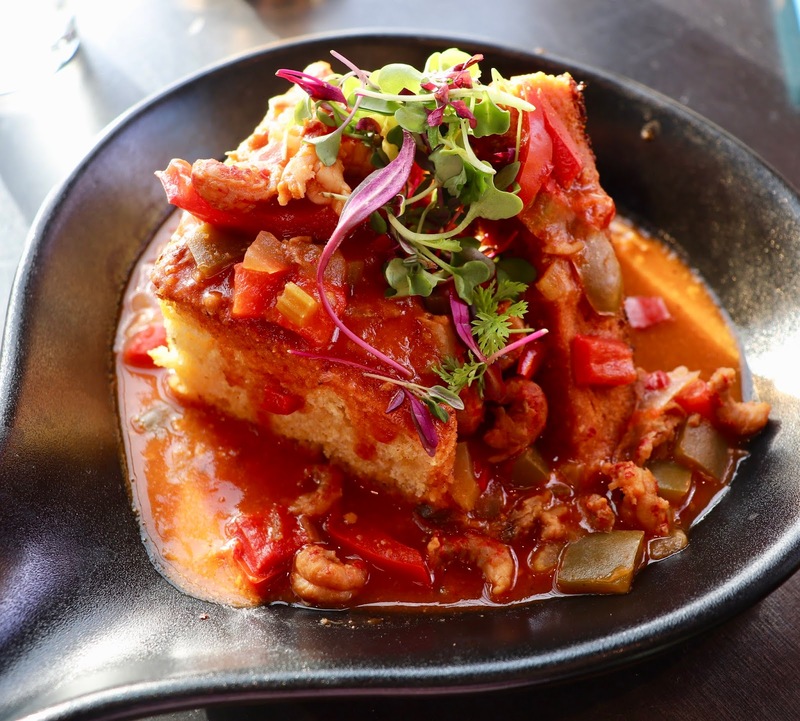 Served with a foie gras cornbread, this was just a little spicy, and just filling enough to sate our appetites to want more. 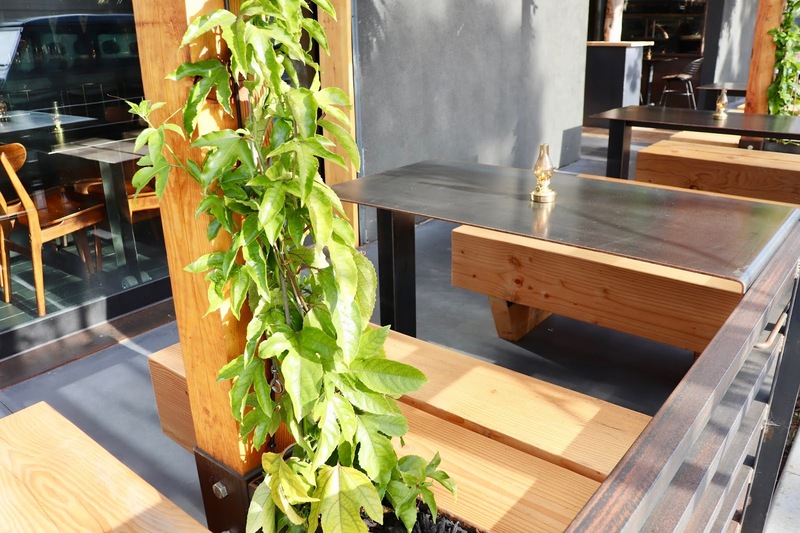 Although the dishes are intended for sharing, this would certainly be a good, filling meal. If you're skittish about crawfish, don't sweat it -- they're just tiny little shrimps. I can't resist scallops, and knowing that New Orleans chefs know their way around seafood, I was sure not to be disappointed. Peaches and scallops are not a combination I would think a match, but it worked quite well. 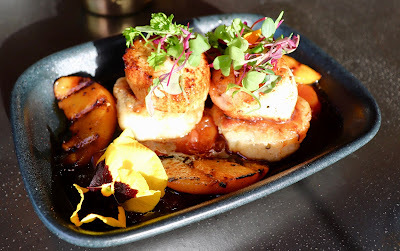 Served on a creamy potato latke, these scallops were perfection in just a few delightful bites. The grand main course was selected from the menu of large plates, with plenty of steaks and larger servings of seafoods. Sides are ordered a la carte, with numbers like the goat cheese mashed potatoes tempting our palates. 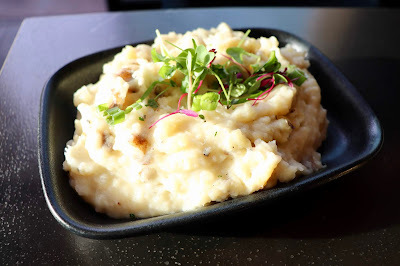 The mashed potatoes were savory, creamy goodness. Bad for my thighs, but delicious in my mouth. 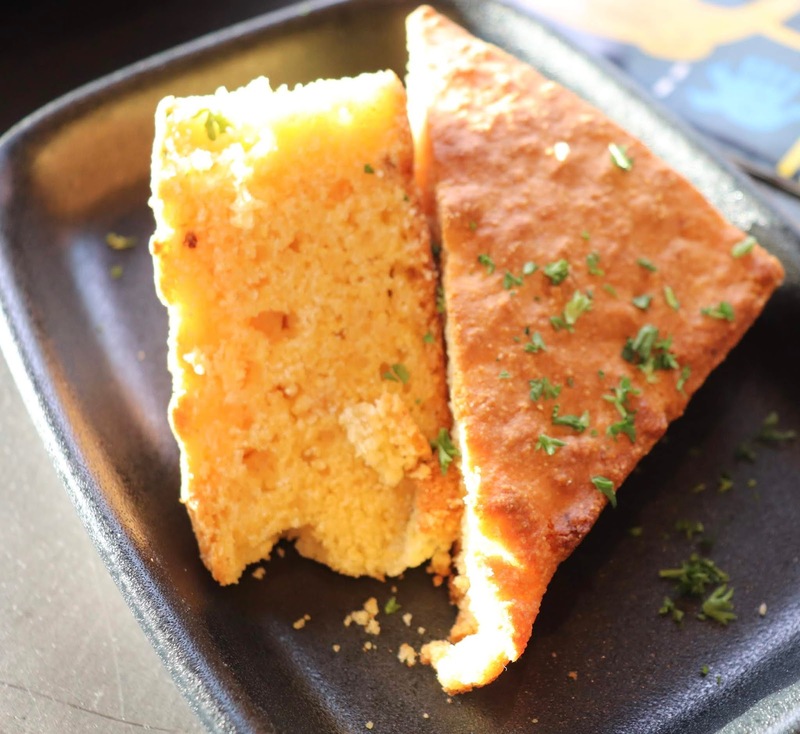 Sweet potato cornbread provided a perfect sweet bite to balance the potatoes. The showstopper of the night was the Crawfish Monica Ribeye. 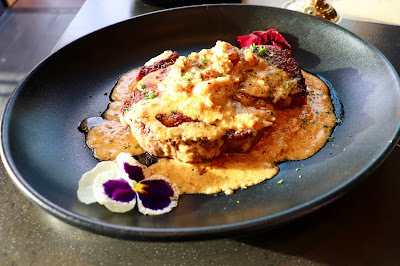 A properly cooked (medium rare) ribeye steak, which is lovely on its own, smothered with a delicious, super savory, creamy crawfish sauce. I never knew how well a creamy seafood sauce would work on a steak, but it just did. It was truly one of the best things that I've ever eaten. I was pretty done after that steak, but I was determined to try the two desserts -- Ponchatoula Strawberry Shortcake and Ooey Gooey cake. The shortcake was served with very ripe berries and homemade whipped cream. What made it so special was the cheddar cheese biscuit. The balance of sweet and salty was perfect. 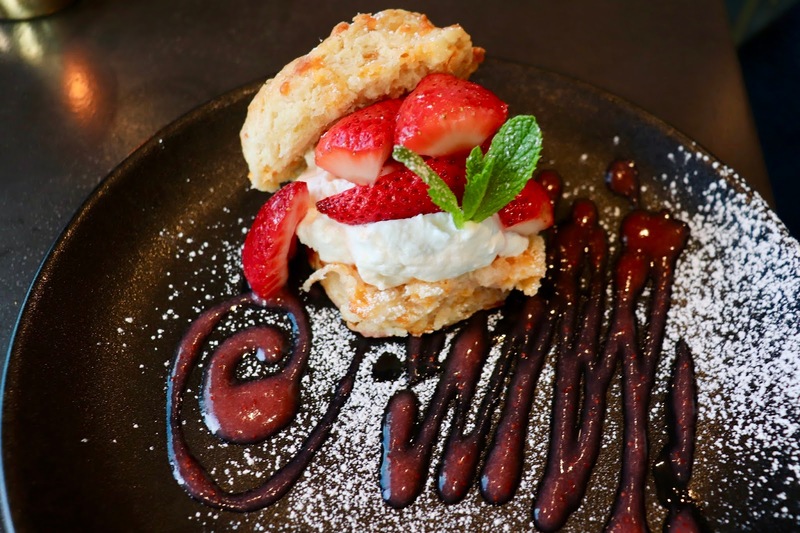 Cheddar cheese is often added to apple pie, so why not a strawberry shortcake? 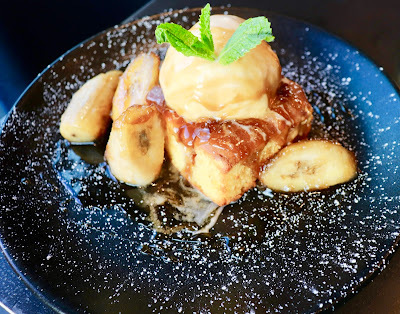 The Ooey Gooey cake was sweet, sweet, sweet. 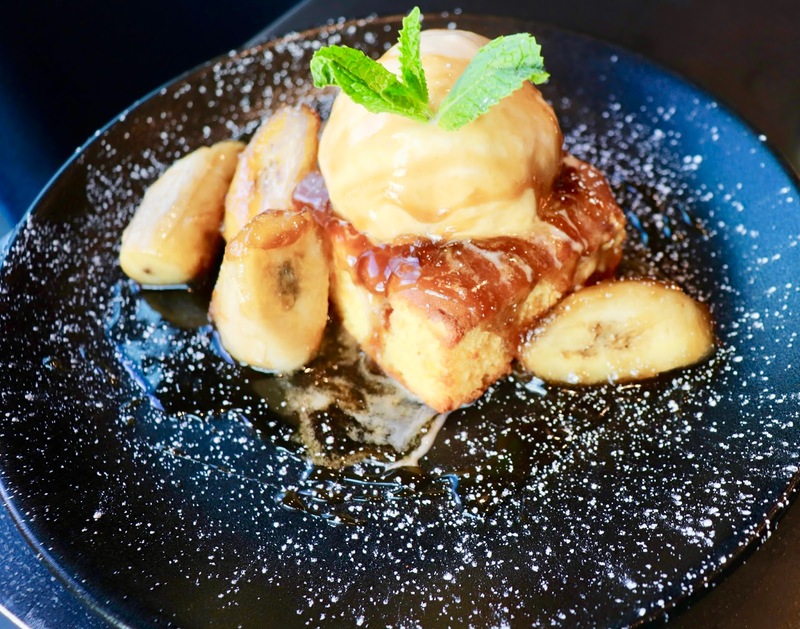 It was a yellow poke cake with caramel, served with vanilla ice cream, and bananas foster. If you have a serious sweet tooth, you will love this cake! 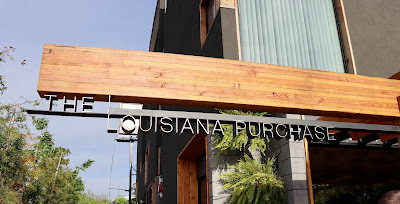 Louisiana Purchase kicks off its brunch menu next Saturday, and is open Wednesday through Sunday for dinner. Reservations at Louisiana Purchase.